This Halloween was mildly nostalgic for Husband as memories of his youth wove in and out of current activities. 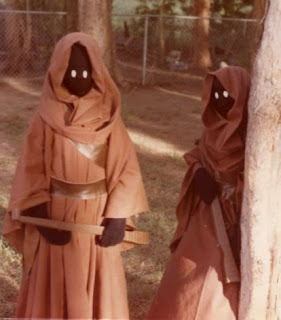 One of his most memorable Halloween costumes was the jawa ensemble his mother made in 1977. This year, he wanted to recreate that memory for our boys. Everything except our oldest's head piece was home made. Using battery operated Christmas lights, we were able to duplicate the mask for our Youngest. 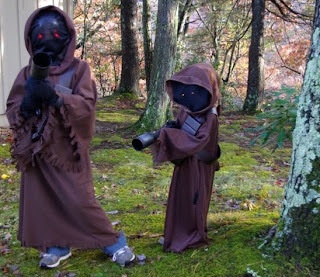 (By the way, jawa eyes are yellow, not red...the store bought version is a factory error!) I'm quite pleased with the way everything turned out, given that the costume was rather a last minute effort.! We generally spend Halloween at home, but this year we went to the family cabin in Black Mountain, North Carolina. It was a lovely time and one I hope to repeat again next year. I was mildly concerned because I couldn't find any advance information about trick-or-treating events in the area. 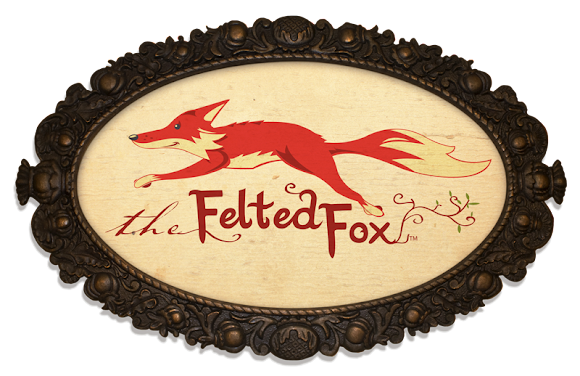 Fortunately, we learned about the unofficial treak-or-treating that happens in a neighborhood bordering downtown Black Mountain. As far as I can tell, information about this local gathering is spread through word-of-mouth only. I am grateful that we got some advice from year-round residents and were able to join in the festivities. Looking back to Saturday, though, I shudder at our parental lack of just-in-case planning. The Church Street neighborhood that borders downtown Black Mountain was a fine place to trick-or-treat but, my goodness, they don't have an abundance of street lights! This became highly apparent as darkness settled in. This darkness was further intensified by both the crowds of people, the drizzling rain and the relatively narrow streets. It would have been so easy to lose track of our kids. As it was, this thought didn't occur to me until my husband, my youngest and I lost the larger group. That's when everything hit me and THEN I worried about my oldest who was with the larger group. I was SO relieved we relocated everyone and I saw that Oldest was safe and sound. I canNOT believe that not a single one of us thought to bring a phone. We were all so focussed on getting dressed up and out the door that what-if's didn't occur to us.